1. 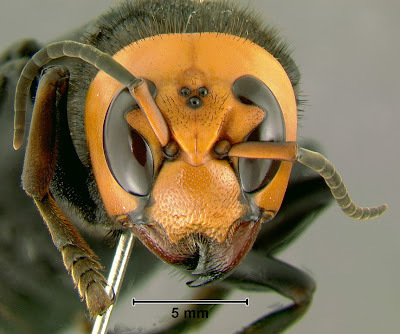 Japanese Giant Hornet – Actively attacks people by spraying their eyes with a flesh-melting poison… presumably to feed on the resulting goo, like they do with other insects. Also, the poison contains pheromones which attract other hornets to the feeding ground. This technique is centered for consuming bee-hives, but sometimes they attack people instead. 2. Bullet Ant – Workers aggressively attack any potential danger to the arboreal hive, and thus drop onto people walking below the hive. They shriek before attacking, so you get some warning. On the plus side, they aren’t life threatening, but their neuro-toxin poison is considered one of the most painful things you can experience. 3. Killer Bees – Killer bees also aggressively defend their hive, and give no warning they are attacking. 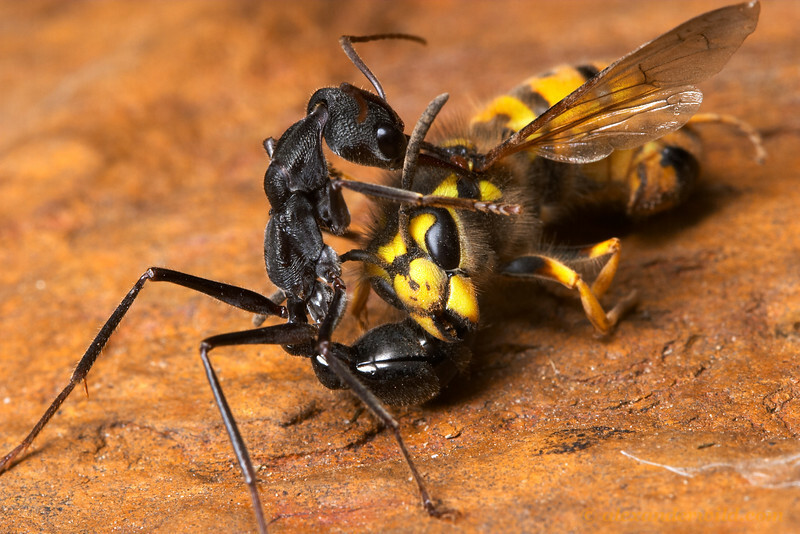 Further, when one bee attacks or dies traumatically, it emits a pheromone causing the entire hive to attack. They’ll also keep attacking the target until its dead, or has retreated about half a mile from the hive. 4. Army Ants – Unlike most ants which build a permanent hive, army ants are nomadic. The workers build a temporary ‘bivoac’ ball with their own bodies, allowing the queen to lay eggs and larva to be fed. When the queen is done laying eggs, the whole hive starts roaming again. 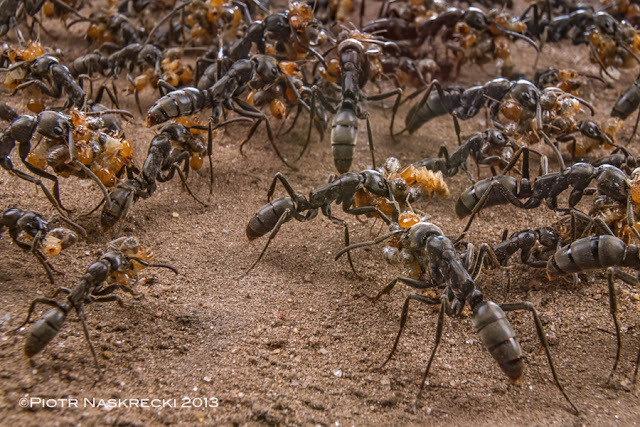 While nomadic, the ants attack and consume everything in their way. They usually travel with a main column (where the queen is protected) with a few flanking columns, but some hives travel in an erratic braided columns which look more like a carpet of ants. And they’re completely blind, which is why they blindly attack everything. 5. Bot Fly – This fly has a parasitic larva that has developed very specific ways of infecting various hosts. The one that hosts on people somehow gets their eggs to be carried around by mosquitoes, which deposit the eggs directly on the skin. The tiny larva hatches and immediately starts burrowing; it’s so small you won’t feel it. 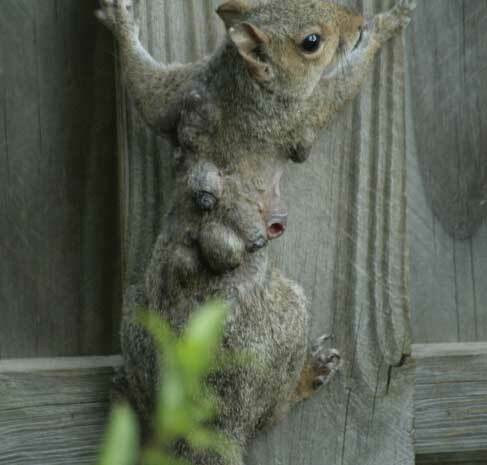 It quickly grows, eating all nearby flesh/organs. There have even been some cases of the larva entering the brain and killing people that way. Bull ants are also pretty scary. So are the Driver Ants of South America (Saifu). You see them marching, you stand out of the way. Remaining as still as you can so that you don't attract them. 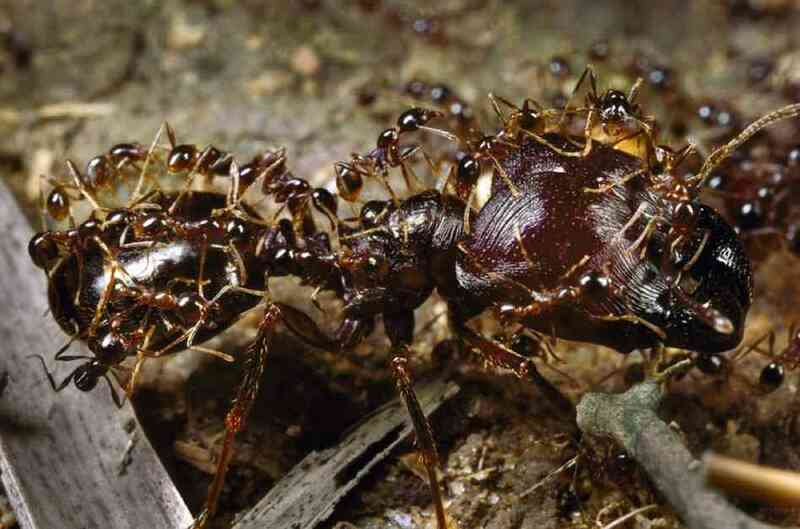 For Bug fluff, I like the army ant colony model the best, but perhaps it’s too well-known/recognizable to use directly. I like the idea of having two types of Space Bugs; one kind builds hives, the other is nomadic. For the hive builders, I’m thinking of modeling them off Killer Bees, making them super-aggressive, and spreading with the standard bee swarm. For the nomadic bugs, they’re also super-aggressive by generally wrecking a planet of anything useful before moving on… but they’re generally peaceful when planet-based. So there’s two kinds of bugs; one kind conquers planets, leaving nothing behind, but generally doesn’t have a space presence. The other has a very large space presence, and actively hunts potential threats near the hive. Nomadic planets are hellish (since they strip-mine on a huge scale), hive planets are verdant. 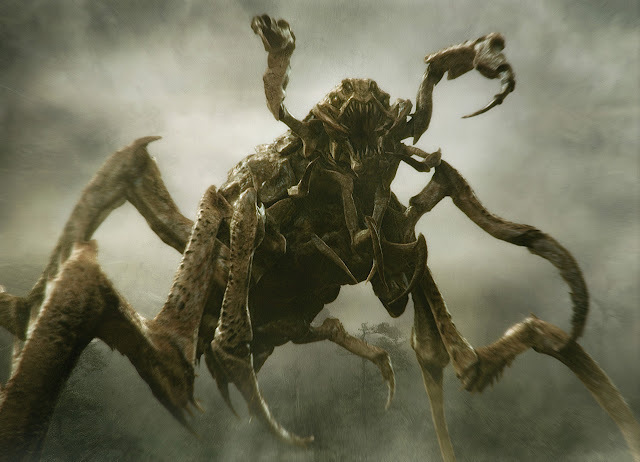 The nomadic bugs would feel like Tyranids (since the whole fleet shows up on the planet and lands everything they have at once) while the Hives would essentially create regions in space where only the foolish or desperate enter. GW has done the swarm/nomad thing aplenty. So let's concentrate on the hive model first. With swarms limited to the creation of new hives. Hive bugs could potentially be more subtle when attacking nearby planets, as they rely on the fleets to protect the hive. I’m not thinking of having things like Genestealer Cults, but instead commando Strike Forces targeting key infrastructure… bugs that have learned how to camouflage themselves in plain sight on alien worlds, by mimicking the target species. Heck, there was even a movie called Mimic that explored this concept. I’m thinking of something more like the Thin Men from the latest version of X-Com on consol games; heck, steal the X-Com concept entirely, where the Hive Bugs study a threatening planet for a while before attacking. Of course, the bugs don't care if the pheromone trail (or the electronic equivalent) they're following is 'natural', or cult-made. Nor do they much care if a particular hive was the result of a natural swarm, or the work of cultists. Who smuggled a queen larvae and 'planted' it in a prepared place (with 'evolved' human caretakers) in order to bring the Turids' 'perfection' to a Human/Colser world/habitat. In fact, the bugs might be 'evolving' traits that attract cultists. Such as 'priest' bugs that hang out with cultists, mimic their speech with highly 'interpretable' clicks, and make them feel like they're 'communing' with the hive (instead of a single dumb creature). Turning what would normally be a bothersome, but manageable insect species into a civilization-ending threat. It's the same sort of human insanity that will cause humans near Colser space to turn themselves into Demons and whatnot. Or to technologically give themselves psychic powers. These things don't 'exist' naturally in our universe. But are brought into existence through technology and Human imagination. It's also a way to personalize the Turids, without compromising their alien nature and hive mind. Now I suppose none of these matters unless it can translate to units. So, researching insect dimorphism, it turns out hive insects are the ones which have a vast variety of forms. Almost every species has sexual dimorphism (even humans) but ants and bees take it to completely different level. Most have a major and minor worker form (“warrior” ants are simply large workers; aka major workers) and a few have several different variations within these two categories. Further, not every hive has only one Queen, and sometimes there is even morphism with the drones. This vast variety could be used to explain any model being used by the species, as well as why they have so many different forms. Further, the Hive Bugs and Nomadic Bugs could be different species entirely… maybe even two different factions instead of one. And ants fight themselves plenty, but not within the same species… but humans seem to have no problem with killing each other, so why not Space Bugs? To make it more interesting, the Hive Bugs could be more like termites, and the nomads more like bees. True enough. But let's start with the hive-kind. We can expand later if we need to. So, what needs to be done from here? I like the idea of bugs having leaderless combat “squads”, for starters. Since the game currently makes squad leaders important, I think each bug squad should have a temporary squad leader each turn, to keep the same rule mechanics. My vote is the leader model is nominated at the start of every turn based on what is the current “center” of the squad… but I don’t know how to easily determine that. I also like the concept of only moving the leader, then dispersing the squad around it. Having played 100+ model Tyranid armies in 40k tournaments, I know there needs to be a fast, easy way to move a large model-count squad around the table, while still being proper for the rules. The movement model that we've talked about is to have the player pick a new leader model for each squad every turn. With no restrictions on which model that is. They then move the leader, and place the rest of that unit's models anywhere within X inches of the leader. In practice, this gives the bugs an extra X inches of movement from turn 2 on. It also lets them 'turn' and shift center quickly. Like a flock of birds. Which is pretty cool when you try it out on the table. It might also be interesting to have rules that alter as the bug squad size changes… maybe something like 40k’s Instinctive Behavior, but something that’s actually beneficial. For example, maybe a larger squad has better offensive stats, while a smaller squad looses the offensive stats and gains defensive stats. Or maybe larger units are more defensive, and smaller squads trade defense for offense. It's an interesting idea. The first thing to do would probably be to change their evasion based on unit size. Something like 10 - num_models. So you auto-hit large blobs, but have a LOT of trouble hitting just 1-2 bugs. Space Bugs should be devastating units in base-to-base combat, especially to Knights and Paladins. Absolutely. I'm thinking Space-Hulk levels of melee ability. You DO NOT want them on you! I don’t know how to do that with the rules, but I guess good AP is the way to go. Good AP, the ability to strike while consolidating, the ability to swarm a high WS model and lower its effectiveness. There's a lot of ways to go with that. The opening scene from Star Craft: Brood Wars keeps going through my head… poor guy was like a turtle on its back. Further, perhaps Bug Guns should concentrate on disabling/debuffing their opponents instead of raw killing power. Something like John Steakley’s bugs from Armor. I often wondered if Tyranid Warriors were designed from his Bugs. Haven't read 'Armor'. I'll keep an eye out for it at the shops. Too bad there's no eBook version. If there’s a unit to copy into WarStrike, it’s Genestealers… from Space Hulk. A genestealer utterly wrecks everything in hand-to-hand combat; Terminators, Marines, IG. Somehow that’s been going downhill for them for almost 20 years. Now, you’d be lucky to get them into HtH combat with enough numbers to actually kill something. If Space Bugs start here, and we make them something fun to play, then everything should work out. I want the Turids to be a close-combat army primarily. The best there is. With very little 'shooting' in the conventional sense. They might spit something up all over you from 6-12" away, but they're not running around with 'living' versions of the same weapons that everyone else has.